Ian and I returned to Finland to visit several EMS agencies interested in Siren. With the help of Johan Nyman, the Trade Commissioner at the Canadian Embassy, we had a very productive and useful visit. While most of the trip was the usual rush from meeting to meeting, we had some unplanned extra time at one of our stops in Kuopio, so the guys broke out the laptops to ‘do some work’. In reality, it was just an excuse for them to look at Johan’s magnificent bell. I spent only 18 hours in Helsinki on my first visit. It was the middle of winter, the skies were overcast, and it was raining. My shots were bleak and dark, so my impression of the city was a somber one. This time, I spent several warm, sunny spring days in the city. Helsinki is as far north as Yellowknife, so mornings start quite early in the spring. It was light at 3:00 a.m. and the sun peaked over the horizon around 5:00. It was almost impossible to take a dark and dreary shot this time around. Compare this shot of Tuomiokirkko, the Helsinki Lutheran Cathedral, taken on my last visit to the following shot taken on this trip just at sunrise. I took the shot above from the Uspensky Russian Orthodox Cathedral, which is on a hill looking back at the Lutheran. The Orthodox church is much more ornate than the Lutheran, and the morning sun produced a nice, warm glow as it hit the bricks and the golden domes. I also had enough time to meet Laura and Kirsi, classmates of mine from Pearson College. It was wonderful to see them again and to get caught up. While a lot of time has passed since I have seen either of them, I still continue to learn from both. The next time, I plan on spending more time with them taking a proper portrait, rather than a ‘gun and run’ shot. Scott, thanks for participating in the Daily Photo Map. A thumbnail, of your latest photo, now appears on the map. 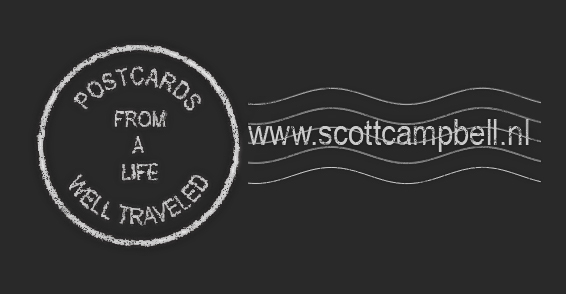 I look forward to your postcards from a life well traveled.